A Thing for Roses: Another New Collection? I've heard it said that three of something makes a collection. Well, recently I picked up a cute butter pat at the Portland Expo and wrote right here on my blog that it may be the start of a new collection for me. As if I needed to start a new collection. To say that I have a lot of collections would be an understatement. Here are just some of the things I collect. Please keep in mind that for many of these items, you are in no way seeing the whole picture (I mean collection), but just a sampling. 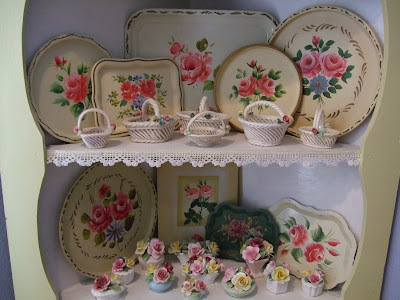 Also shown here are some pottery baskets with roses and rose posies. Other collections, not pictured, include vintage pillowcases, pairs and singles, rose patterned, or pink, vintage millinery, crocheted hangers, ticking fabric, vintage landscape prints or paintings, (no longer collecting, but still have lots), vintage ephemera with roses, babies or little antique girls, skeleton keys, cream or white buttons, and I know there's more, but you get the idea. I have a lot of collections. Really, I have too much stuff. I need to pair down and only keep what I really, truly love. I really am working on it. Really! BTW, look what I found in one of my kitchen cabinets. Three butter pats. Looks like I already had a collection and didn't even know it. 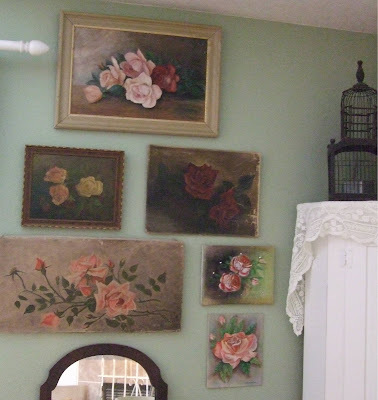 If you had any doubt as to why I call my blog "A Thing for Roses," this post should clear that right up. Added note: Please visit Isabel's blog for her 100th post giveaway and to learn a little more about her. Your collections are wonderful! I am so jealous! Oh I love all of your collections! !I never thought of myself as a collector, but I DO know that I have 3 or more of certain things...lol! Voila' I guess I am a collector, too! OH MY GOODNESS!!!! What a wonderful collection... I have a few of some of the things you have, but wow.. 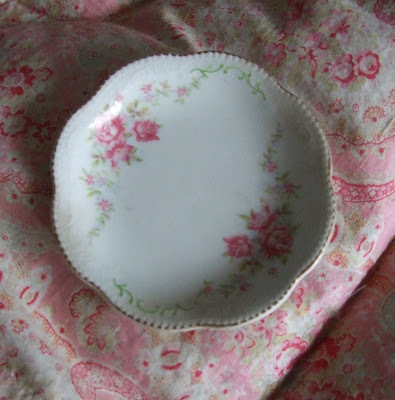 I could sit and just stare ate your things for hours.. Those rose tin trays or toile trays are to die for.. Heck everything you have is to die for. lol.. Thanks for the eye candy..
Holy Smokes!! I love your collections! 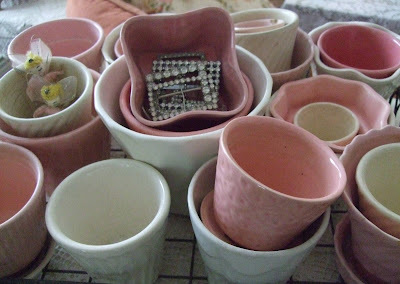 My favorites are the pink and cream pottery and the silver watches. I like butter pats too, they are sweet and fairly inexpensive. Wow! I love it all!! ohmygosh!!! your collections are amazing:) wow!!! 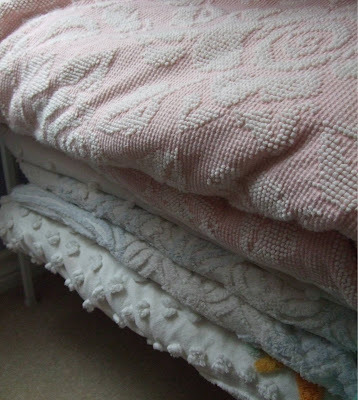 they are all so pretty too...you really have some wonderfully lovely things!!! I also think many of us should have been born in a different era. I know the saying about having more than 3 is a collection (or is it 2)? I've forgotten already. Anyway... shhhh don't tell my husband, the way things are right now,maybe he'll never know about my collections (er, pretty things)! You have sooooo many beautiful things!! I'm green with envy! 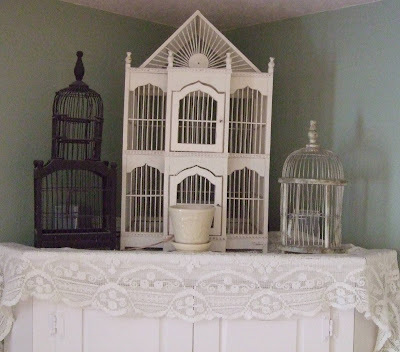 Cathy, I love your collections! 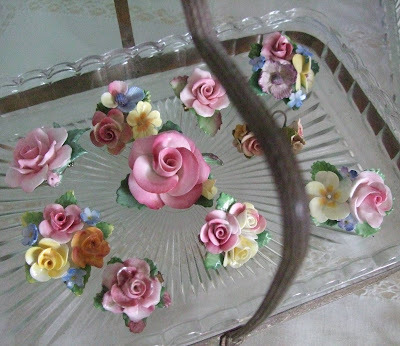 Especially the rose pins - where did you get all of these? 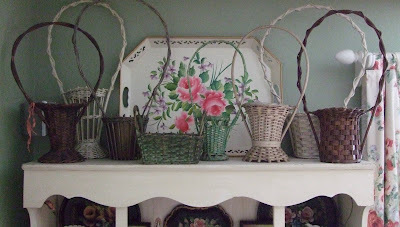 I love the vintage baskets too, and ALL your other stuff! Just beautiful! I love your collections! Collecting things is so much fun! I'm turning into such a collector too lately! What fantastic collections you have. It is such delight to be able to explore someone else's treasures. 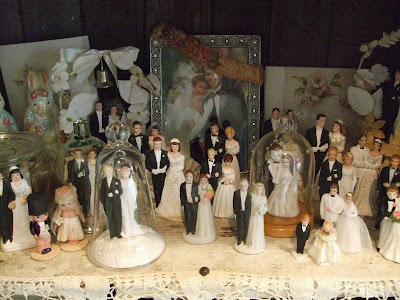 The bride & groom collection is most unusual. I also really like the buttons, trinket boxes... Have spent ages looking at all the pictures, thank you for the delightful tour! Lisa! you got so many beautiful and wonderful collection! and I want to collect the same! I can't stop coming here and drools! You are so lucky to stumble upon beautiful stuff.. I wish we got more flea markets and goodwill kindda store here..
Hi Lisa! I just love your collections! Especially your rhinestone jewelry and vintage hats! We do collect a lot of the same things! 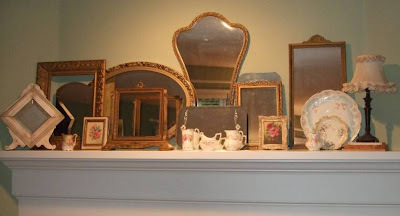 Organization is the key to great displays! Thanks for sharing! Oh my, what beautiful collections!I could spend days looking at all you photos! Wow, you have lots of lovely collections! Very nice! 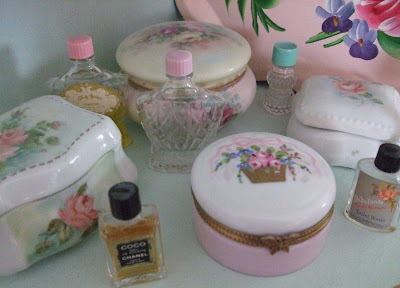 I love all your wonderful collections; especially the gorgeous little pill boxes, and those really beautiful mirrors! 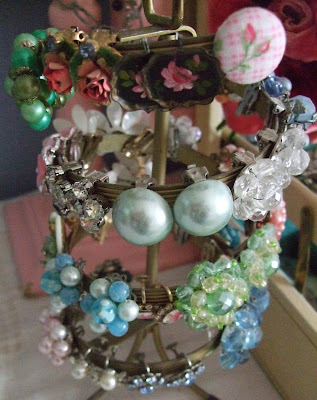 Seeing all of those rhinestones makes me regret parting with so many of my mothers pieces. I was drooling as I looked at all your pictures of your rosey collection. Everything is just amazingly beautiful. I wanted to let you know that I received your beautiful pillow!! Thank you so much. It is gorgeous and I love the rose barkcloth on the front and the yummy paisley fabric on the back. I'm thrilled that it's mine! collections you have. He thinks I am addicted to collecting. Yours are all very beautiful and well displayed! 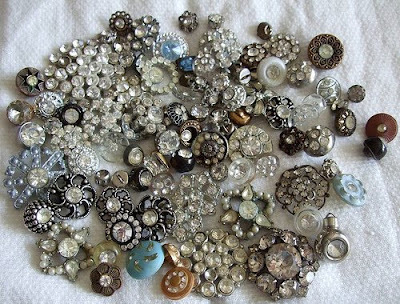 Oh so loved the BLING & buttons! You have a ton of treaures. have fun on your trip. I'm getting to go away for a jewelry class with Diana Frey & I am pumped. Have a great week. Gorgeous!!! I love them all. 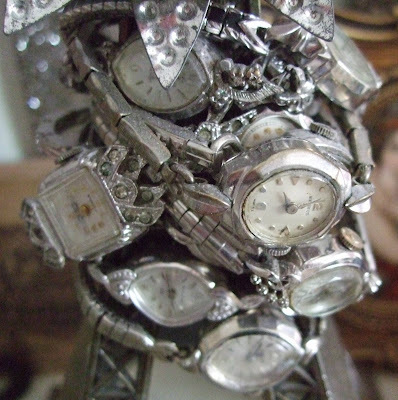 You are very lucky to have been able to aquire so many beautiful things for your different collections. 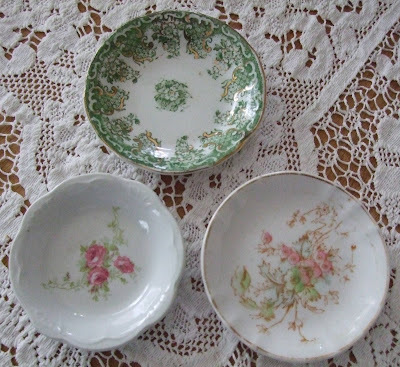 I have several collections of my own and just today have started a new feature on my blog titled Teacup Tuesdays where each Tuesday I will show different teacups from my collections. Stop by for a peak when you get a chance. !!!!!!!!!!!!!!!!!!!!!!!!!!!! You had my heart racing with quite a few of those. I could move right in to your house, you have all my favorite things! Those are some amazing collections. The pill boxes has to be my fav though. Your things are so beautiful. Could it be more beautiful??? AMAZING. STUNNING. LOved drooling on everything, ha! Love your wedding couple collection! Love the roses pictures. I have a number of them myself and find they really catch my eye in the antiques/collectables shops around here. They are so nice, humble, sweet and just light up whatever wall I put them on. Well, next time any husband complains about us buying more stuff for our collections... we should just show them your blog page!!! You win the most collection award... congratulations! I love you blog and your beautiful collections. 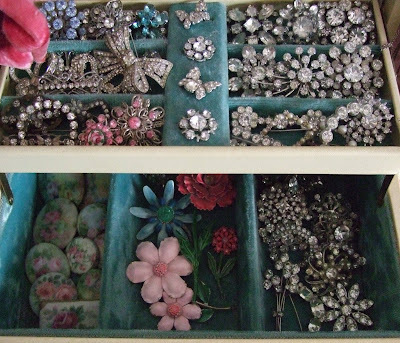 I have a collection of rhinestone brooches too. Hi Lisa! I am in absolute awe over your beautiful collections! 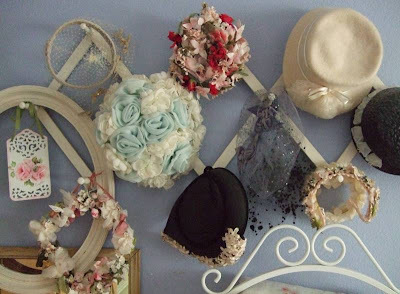 I think my favorite is the baby blue and white rose hat, YUMMY! Wow! How did I miss this post?? Those are some yummy collections!!!! And you have a great talent for displaying them in the most beautiful ways!